FILE - Police disperse demonstrators protesting the shooting death of unarmed black teenager Michael Brown in Ferguson, Missouri, Aug. 20, 2014. U.S. Attorney General Eric Holder is calling for "immediate, wholesale and constructive action" in police and municipal court practices in Ferguson, Missouri, a Midwestern city gripped by tension and intermittent violence since the August shooting death of an unarmed black teenager by a white police officer. Attorney General Eric Holder discusses a 'searing report' charging the Ferguson, Mo., police department and municipal court with racial bias. 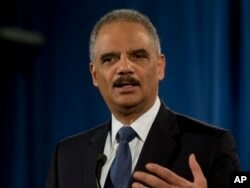 Holder urged "necessary reforms" Wednesday afternoon in a news briefing focused on a newly released "searing report." It said police routinely violated the constitutional rights of African-Americans by using excessive force against them, often making arrests without probable cause, and it accused the municipal court of exploiting blacks as a revenue source for the city. Such behavior has "eroded police legitimacy," Holder said, and created "a highly toxic environment" ripe for the racial tensions that exploded last summer. "Of course, violence is never justified," Holder said. "But seen in this context – amid a highly toxic environment, defined by mistrust and resentment, stoked by years of bad feelings, and spurred by illegal and misguided practices – it’s not difficult to imagine how a single tragic incident set off the city of Ferguson like a powder keg." The report on Ferguson policing and court practice is the result of a six-month investigation launched after the August 9 shooting death of teenager Michael Brown by a white police officer during a street confrontation. Even with their conclusions about Ferguson police, however, federal officials announced Wednesday they have decided they will not bring civil rights charges against officer Darren Wilson, who has resigned from the city's police department. The Justice Department, in a second investigation and report, concluded there was no evidence to disprove his contention that he feared for his life in the incident, nor reliable evidence that Brown had his hands up when Wilson shot him. "Michael Brown's death, though a tragedy, did not involve prosecutable conduct," Holder said at Wednesday's news briefing. A state grand jury cleared Wilson of Brown's death last November, a decision that triggered heated protests in the small, majority-black community near St. Louis, as well as across the country. Holder, who described himself as the brother of a retired police officer, said he has "immense regard for the role [police] play in communities" and for their integrity. "Negative practices by individual officers and departments" erode police legitimacy and jeopardize police everywhere, he said. After conducting hundreds of interviews and reviewing more than 35,000 pages of police records and other documents, the Justice Department found that while blacks comprised 67 percent of Ferguson's population of roughly 21,000, 93 percent of the arrests were of African-Americans. The report said that 85 percent of all routine traffic stops were of black drivers and 90 percent of all traffic citations issued. "It seems the motivation is not public safety but public funding," said Nazgol Ghandnoosh, a research analyst for The Sentencing Project, a Washington-based organization that promotes an equitable U.S. criminal justice system. She studied Ferguson and other cases for a recent report, "Black Lives Matter." According to the 102-page Justice Department report, " Ferguson’s police and municipal court practices both reflect and exacerbate existing racial bias, including racial stereotypes. Ferguson’s own data establish clear racial disparities that adversely impact African Americans." In 2013, the most recent year with complete data, the court issued more than 9,000 warrants, mostly to blacks and largely for minor violations such as missed court appearances or fine payments. By state law, failure to appear in court for a moving traffic violation results in license suspension. Ferguson has made the penalty more "onerous," the report said, by only allowing the the suspension to be lifted after payment of an owed fine is made in full." Lack of a driver's license, especially outside an area with strong public transportation, can limit the ability to earn a living or care for family. That, in turn, can destabilize a household. The report also reveals that Ferguson officials routinely circulated racist jokes on their government e-mail accounts. In one email written in November 2008 after U.S. President Barack Obama's election, a city official wrote that Obama would not serve long, saying, "What black man holds a steady job for four years?" It encourages measures such as more foot patrols and social interaction with residents, rather than patrolling in vehicles. "A small municipal department may offer greater potential for officers to form partnerships and have frequent, positive interactions" with residents, the report concluded. City officials say they are reviewing the report and Justice Department officials are negotiating an agreement with the city to change its practices. But if no agreement can be reached, the Justice Department could sue the city to seek a court order mandating changes, a legal action the U.S. government has taken against other law enforcement agencies in recent years. Ferguson police reforms forced by the Justice Department could improve community relations, but also could have a negative impact. "Ferguson would be the smallest town ever to undergo the expensive court compliance process. It could face bankruptcy and the spike in crime that often follows this type of consent decree," St. Louis Public Radio reported, summarizing concerns expressed by former St. Louis County Police Chief Tim Fitch. "Ferguson will not survive this financially," Fitch predicted, citing the example of East Haven, Connecticut. That slightly larger community spent $3 million on reforms following its own Justice Department investigation. But the head of Arch City Defenders, a St. Louis organization that assists the indigent, said the Justice Department erred by limiting its investigation, and its demand for reforms, to Ferguson. "Without comprehensive and transformational change or the abolition of the municpal court system, individual reform in single municipalities will never truly change the lives of the most vulnerable among us," Thomas Harvey was quoted by St. Louis Public Radio. Lowering threshold for civil rights violations? The Ferguson case – coupled with other high-profile incidents, including the police chokehold death of Eric Garner, a black man in New York – led to a widespread outcry over aggressive police tactics against African-Americans and other minorities. The Justice Department has launched some 20 civil rights investigations of local police departments during the outgoing attorney general's six years in office, including the probe of the Ferguson department. Holder told POLITICO news organization last week that, before he leaves office later this month, he plans to call for a lower threshold of proof for hate crimes. "I think that if we adjust those standards, we can make the federal government a better backstop – make us more a part of the process in an appropriate way to reassure the American people that decisions are made by people who are really disinterested," he said. "I think that if we make those adjustments, we will have that capacity." Holder also said the Justice Department already is exploring new reforms in civil rights law, including stronger hate-crimes legislation. Changes in policing and courts are being considered, and implemented, among other local jurisdictions. In New York, for instance, the police department is beefing up efforts to improve community relations. The city already has made concerted efforts to reduce penalties for minor offenses, such as marijuana possession, the Associated Press reports. In some precincts, police have met with "at-risk offenders," including gang members, to connect them with social services and crime-prevention programs. And the city council speaker, Melissa Mark-Viverito, has proposed aiding low-income citizens through a citywide bail fund and by ensuring their access to legal representation. The Justice Department's civil rights investigation in Ferguson "is very important" for documenting "this multitude of violations," said Dorothy Roberts, a University of Pennsylvania scholar on race and civil rights. "It's not just black citizens telling individual stories." But she said the real test will be in the implementation and enforcement of changes. The two reports "show that there's a deeply entrenched culture and political practice of descriminating against black citizens ... destroying their rights and exploiting them for the benefit of city government," Roberts said. "It's going to take very strong measures to change that and repair community trust."